Place apples in a large bowl. Stir in brown sugar and golden raisins; set aside. Place puff pastry on baking sheet. Roll lightly with a rolling pin. 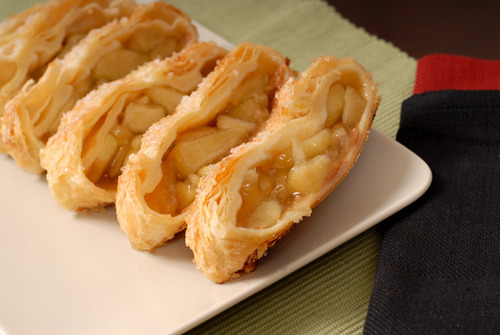 Arrange apple filling down the middle of the pastry lengthwise. Fold the pastry lengthwise around the mixture. Seal edges of pastry by using a bit of water on your fingers, and rubbing the pastry edges together. Whisk egg and milk together, and brush onto top of pastry. Bake in preheated oven for 35 to 40 minutes, or until golden brown. No comments for: "Easy Apple Strudel Recipe"